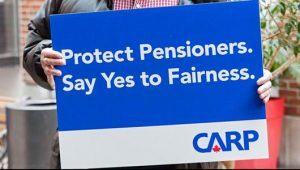 Welcome to CARP (Canadian Association for Retired Persons), today CARP has more than 320,000 members advocate for improved healthcare and financial security for Canadians as we age while enjoying great discounts and benefits. CARP (Canadian Association for Retired Persons) is Canada’s largest advocacy association for older Canadians. Today CARP has more than 320,000 members. As a non-partisan association, CARP is committed to working with all parties in government to advocate for older Canadians. Its mission is to advocate for better healthcare, financial security, and freedom from ageism. CARP members engage in polls and petitions, email their elected representatives, connect with local chapters and share stories and opinions on urgent issues. CARP membership support creates major changes in government policies and protects the dignity of Canadians as we age. Members are also rewarded with discounts on over 100 everyday products and services they know and love from CARP’s trusted partners. In May 2017, Canada’s National Census revealed that for the first time ever seniors outnumber children in Canada. There are now 5.9 million seniors, compared to 5.8 million Canadians, 14 and under. 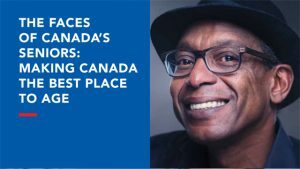 Federal and provincial policy-making that affects older Canadians is more important now than it has ever been. Increasing the Canada’s Pension Plan (CPP): Pensions will increase from 25 % to 33 % of earnings. Eligible pension earnings will increase from $ 54,000 to $ 82,700 annually. Restoring Old Age Security (OAS) Eligibility to 65: In 2012, PM Harper raised the eligibility age to 67. In 2016, it was restored to 65. 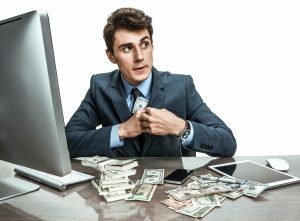 Securing $3 Billion in Homecare Funding: In 2017 the Federal Budget announced $3 billion in funding and extended commitment to $ 6 billion over 10 years. 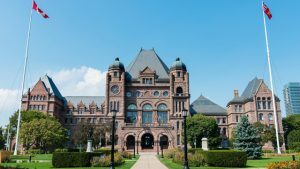 Reduced Senior’s Drug Co-pays in Ontario and Nova Scotia and influencing the Government to add new drugs to provincial formularies. Be sure to check out CARP’s Impact Report. Click here to read CARP's 2017-2018 Impact Report. CARP is a not-for-profit organization and does not receive government operating funding. Its advocacy mission is funded through CARP membership fees and through contributions from our affinity partnerships. Through its affiliation with Zoomer Media, CARP has access to multiple media platforms. Advertisers interested in reaching CARP’s audience provide a full slate of benefits to members, often covering the cost of membership. CARP, formerly Canadian Association for Retired Persons, is Canada’s largest Advocacy Association for Canadians as we age. CARP’s mission is to advocate for better healthcare, financial security and freedom from ageism (age discrimination). CARP members engage in polls and petitions, email their elected representatives, connect with local chapters and share stories and opinions on urgent issues. CARP members also get more than 100 benefits and discounts in healthcare, lifestyle, traveling and many more. CARP croit qu’une population vieillissante constitue un enjeu de société qui ne doit pas préoccuper seulement ceux qui atteignent un certain âge ou une certaine étape de leur vie.Répliques Montre C’est pourquoi nous avons retiré l’exigence d’âge de 50 ans pour se joindre à notre organisation et que nous insistons sur la nécessité de créer des relations intergénérationnelles harmonieuses et positives. 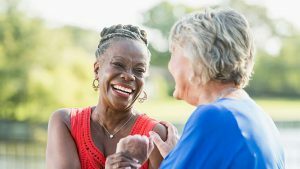 Nullement besoin d’être à la retraite pour devenir membre. Many CARP members are active participants in their local chapters. Our chapters are active advocates who work for local change while supporting national efforts too. Many CARP chapters also sponsor events of interest to those who are 45+ in their communities. See below for a list of current chapters. You can join CARP and your local chapter at the same time by selecting your local chapter below and clicking the 'Join Now' button. CARP is a federally incorporated not-for-profit corporation. Below you will find the most recent audited financial statements, as well as the organization's bylaws. CARP is an advocacy group. We are unable to provide personal assistance or support for individuals. If you are an individual in a health crisis, please go to your local emergency department. For Media Inquiries, contact [email protected] (for quickest reply) or toll free 1-888-363-2279. Advocacy is a key component of our mandate at CARP. As a grass-roots organization, we particularly value your input as CARP members. If you have a cause you believe we need to address, please tell us by filling out our Advocacy Cause Form here. CARP est un organisme national de défense des intérêts qui représente la population vieillissante du Canada. Veuillez toutefois noter que pour le moment, nous sommes en mesure d’offrir des services à nos membres en anglais seulement. Toutes les communications et la correspondance du bureau national de CARP est actuellement en anglais. Here, you’ll find answers to Frequently Asked Questions about CARP membership. Some responses will provide an opportunity for you to log in to CARP’S Online Customer Care Portal at my.carp.ca, as seen below. To access your CARP member benefits, you must be registered. First step is to register with your email address and password. Then you will be able to sign in. How do I subscribe to CARP? Visit CARP.ca/join to order your CARP membership. How do I give a gift subscription to CARP? Please log in to my.carp.ca. This is CARP's online Customer Care Portal. If you have not already done so, be sure to register first. Once logged in, you may select "Give A Gift" at the top of the page. If you have not already done so, be sure to register first. Here you will be able to update your mailing address. If you are moving, please update your mailing address six weeks prior to your move to prevent correspondence being sent to your old address. How do I make updates to my email address? If you have not already done so, be sure to register first. How do I unsubscribe from CARP mailing lists and telephone solicitation? Please log in to my.carp.ca This is CARP's online Customer Care Portal. I have purchased a CARP membership, but have not received my CARP membership card. Delivery time for a CARP membership card is 3-5 weeks from when your order is submitted. If you still have not received your CARP card after 5 weeks log in to my.carp.ca to confirm your Account has been set up and that we have your correct mailing address. If everything is in order, please notify our customer service department at [email protected] to have the card re-issued to you. Note, while in my.carp.ca you can print a temporary card until the actual one arrves BY CLICKING ON THE LINK AT THE TOP OF THE PAGE. I have purchased a CARP membership, but have not received my CARP welcome package and Member Benefit Guide. Login in to my.carp.ca to confirm your account has been set up and that we have your correct mailing address. If everything is in order, please notify our customer service department at [email protected] to have a welcome package and member benefit guide issued to you. Note, while in my.carp.ca you can view the member benefit guide BY CLICKING ON THE LINK AT THE TOP OF THE PAGE. 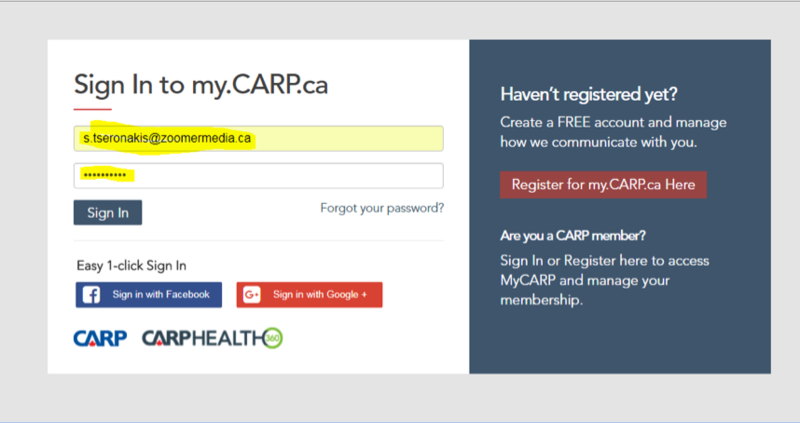 Why can't I access my account through my.carp.ca? In order to log in to my.carp.ca you must register first with your email address and password. If you have registered and are having trouble logging in, please double check that you have entered your information correctly. If you still cannot access your account, please follow the steps below to reset your CARP.ca password. After clicking the link you will receive an email from CARP.ca. Follow the instructions below to reset your password. Password Reset: Open the email from CARP.ca with the Subject "Reset your CARP.ca Password". Please note the password reset link found in this email will expire after 24 hours. Enter the password in the "New Password" and "Confirm Password" fields then click "Set Password". 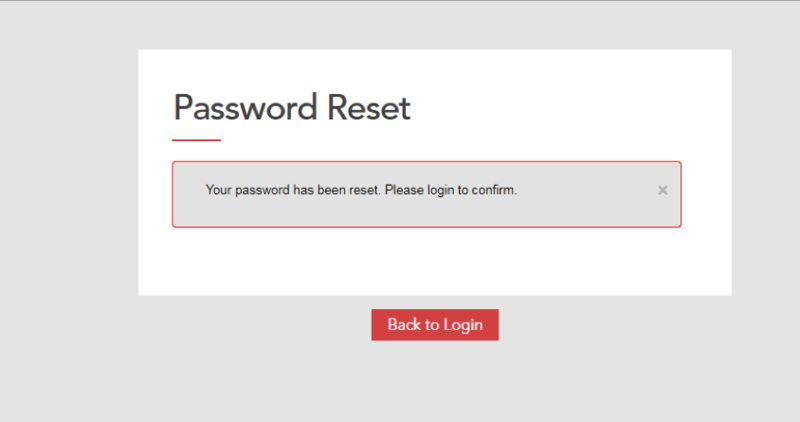 You will see a confirmation that your password has been reset. Click "Back to Login". Sign in with the email address associated with your CARP account and enter the new password you just created and click "Sign in". If you continue to experience problems, please email us at [email protected] providing your complete name, address and telephone number we can reach you at. We will notify you by mail when it is time to renew your subscription. By renewing promptly, you can avoid both an interruption in service and future renewal reminders. For faster service, renew at carp.ca/renew. How do I sign up for automatic-renewal? Log in to my.carp.ca select auto-renewal. You will be notified before being charged each year. Your membership will then renew automatically each year at our guranteed lowest rate. You can cancel at any time. How do I contact you about another question? Your membership support is important to us. 1. NEW and RENEWAL Orders for CARP (1. CARP only; 2. CARP and Zoomer Magazine): CARP Membership fees are non-refundable and non-transferable as of September 1, 2018. This new policy will provide 72 hours for the purchaser to cancel the order and receive a full refund. However, once the order (CARP or CARP and Zoomer Magazine, new or renewal) is placed, and 72 hours (3 days) have passed, then the purchaser decides to cancel the order, the purchaser will NOT receive their money back on the CARP portion of the order. If the purchaser would like to cancel the order, they may do so, but the CARP portion would NOT be refunded and sent to the purchaser. If the order included Zoomer Magazine, CARP portion is non-refundable, the Zoomer portion will allow refunds on un-mailed issues, which would be refunded to the purchaser. 2. IMPORTANT NOTE: This new policy (where CARP portion of orders is not refundable to the purchaser) will only impact orders that come in after September 1st, 2018. Customers who purchased or renewed before this date will be eligible to receive refunds on their CARP membership as they will be grandfathered on the original terms and conditions that were in place at the time of purchase. CARP operates under a unique business model. Through our affiliation with ZoomerMedia, CARP has access to multiple media platforms. 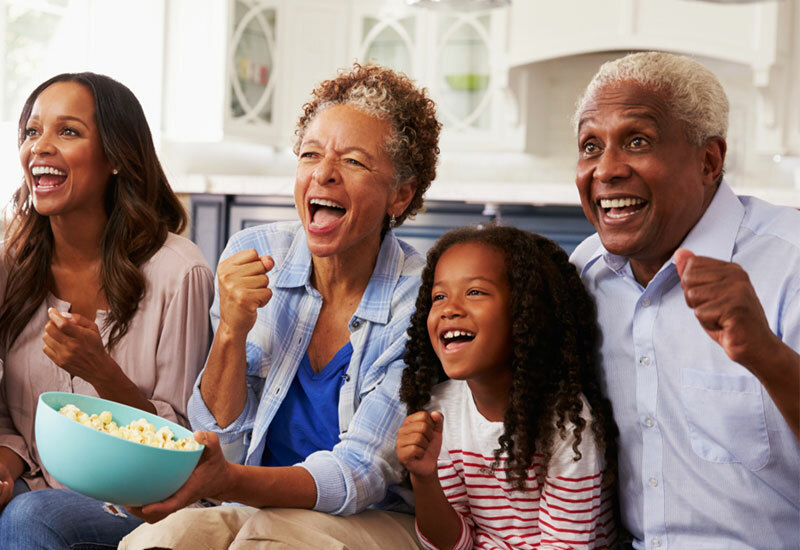 ZoomerMedia’s advertisers interested in reaching CARP’s audience provide a full slate of benefits to members, often covering the cost of membership. In some cases, clicking on links in CARPs website or emails will lead to landing pages on the Zoomer Media website. From time to time, special offers to CARP members are described as CARP approved or CARP recommended. ZoomerMedia advertisers will be screened by CARP’s Due Diligence Committee in order to qualify for any CARP endorsement.